The explosion/eruption of Mount St Helens in May 1980 was the most destructive volcanic event in the history of the USA. The jagged crater left behind, the lahar and landslide deposits and in particular the millions of snapped-off trees, some lying flat on the ground radiating away from the crater, some still floating as dead driftwood on Spirit Lake, are all testimony to the scale of the event, even after so many years. NOTE that the roads leading up and close to Mount St Helens are closed in winter! So this is really only a seasonal attraction. More background info: Mount St Helens is one of a string of volcanoes in the Cascade Mountain range between the Rocky Mountains and the Pacific coast that runs from Lassen Peak in northern California all the way up to Mount Garibaldi in British Columbia, Canada. The range is part of the great Pacific Ring of Fire. Mount St Helens is believed to have an eruption cycle of ca. every 150 years. Prior to 1980, the last recorded/observed eruptive phase had been in the mid-19th century, just as the first white explorers, trappers and settlers were arriving in what was to become Washington State in the Pacific North-West of the then still growing USA. The proper settlement of the territory began only in the late 19th century when the mountain didn't give any signs of life, i.e. when it was dormant. So for most people living around Mount St Helens it appeared to be just a pretty mountain like any other. However, a volcanological study published in 1978 already warned that a major eruption with the potential to do great damage to the area and disrupt lives in a wide region beyond was likely to occur before the end of the 20th century. Only two years later the authors were proven right. There were early warning signs in the spring of 1980. For a two-month period prior to the big eruption there were frequent minor earthquakes, with their epicentre directly underneath the mountain. It was concluded that magma was pushing upwards causing the tremors. Mount St Helens then began to spew small amounts of ash and steam and a small crater formed at the summit of the up to then almost perfectly cone-shaped stratovolcano. In April, the earthquakes had reached such a frequency that the governor of Washington State decided to declare a state of emergency and access to the area of Mount St Helens was restricted. Only scientists with a special permit were allowed in, as were a few loggers during the day. The owners of cabins in the popular area around Spirit Lake were only allowed brief access in convoy to rescue personal belongings. Meanwhile the volcanologists observed the volcano with increased vigilance. The most worrying development they found was a growing bulge on the northern side of the volcano, presumably caused by the magma pushing up older rock and intruding into the volcano below ground. Fractures were beginning to appear as the bulge grew at an increasing rate, at its peak several feet a day – so the possibility of a landslide was seen as the most imminent danger, especially as this could then trigger an eruption. And this is more or less what happened on Sunday, 18 May 1980 – only more dramatically than anybody had predicted. There had been no significant changes in the scientists' measurements that morning, but at about 8:30 a.m. a stronger earthquake than before (at a magnitude of 5.1), and only a mile directly below the northern slope, suddenly set this side of the mountain in motion. It was the largest landslide in recorded history. What happened next has been likened to popping the cork of a well-shaken bottle of champagne. With the landslide exposing the volcano's top to lower pressure, the internal pressure was released suddenly and violently. Unlike the more common vertical explosions, however, Mount St Helens' was a gigantic “lateral blast”, i.e. erupting sideways and moving over the landslide in a northerly direction. The amassed blast cloud of hot ash, gas and rock travelled at a speed of over 300 miles an hour (almost 500 km/h). Some claim it may briefly even have been twice as fast, possibly just about reaching supersonic speed. Obviously there was no outrunning this wall of destruction. The blast that took a form similar to a gigantically oversized pyroclastic flow destroyed everything in its path. In the zone closest to the volcano the destruction was complete. All trees were uprooted and blown away. The landslide and eruption deposits created a completely new moonscape-like desert. Further away, trees were felled and left lying flat on the ground facing away from the volcano in the direction the blast cloud travelled, which later indicated accurately the path of the flow. Yet further away, trees were not felled but seared, leaving behind a forest of standing deadwood, singed branch-less trees. In total an area of 230 square miles (600 square kilometres) was devastated. The destruction also continued beyond the reach of the blast itself (which travelled over a dozen miles from the volcano, in some areas channelled by the topography to reach as far as 19 miles/30 km). Lahars then formed washing a thick layer of a cement-like ash-and-water mixture down the riverbeds emanating from the mountain to the north-west and south-east. Some lahars reached as far as 75 miles (120 km). The mountain itself had lost 1300 feet (400m) in altitude. Where the perfectly shaped cone once was, a gaping horseshoe-shaped crater had opened up, ca. 1.5 miles (2.5 km) in diameter. About one cubic mile (over 4 cubic kilometres) of material had been ejected across a fan-shaped area to the north of the broken volcano. This is now referred to as the 'pumice plain'. Several people were killed in the blast, including volcanologist David A. Johnston who had positioned himself for observing the volcano on a ridge 5 miles (8 km) away with a good view of the north face of the mountain. It was deemed a safe distance. But it turned out to be in the direct path of the lateral blast that nobody had expected. He had no chance of survival. The same tragically applied to Harry Truman, owner of the popular Spirit Lake Lodge. He was the only resident to be allowed to stay in the exclusion zone. The landslide and subsequent blast reached Spirit Lake causing steam explosions and pushing the lake in a corner, as it were, whiles depositing vast amounts of volcanic material in it, which also dammed its outflow. Where Spirit Lake Lodge used to be is now 200 feet below the new waterline of the post-eruption lake. In total, 57 people are known to have died as a direct result of the eruption (as well as thousands of wild animals), but there were also lucky survivors, who had the good fortune that the topography around the particular spot where they found themselves at the time deflected the blast. Others were able to find shelter or were far enough from the blast itself but were then affected by the lahars and ash fall. Over 200 people were rescued, mostly by helicopter, from the area in the first couple of days after the eruption. None had been in the inner “red zone” that had been largely evacuated (and where there were no survivors), but nobody would have thought it possible that an eruption could reach as far as 20 miles or more from the volcano. There are numerous dramatic stories of survivors, who found themselves trapped by mudflows and their paths blocked by felled trees and hot layers of ash ... in a landscape that had been so altered by the cataclysmic event that it had become unrecognizable. The damage to infrastructure was immense too. Much of the former Spirit Lake Highway was washed away, as well as dozens of bridges and some 200 houses/cabins. In total the damage was estimated at over a billion US dollars (ca. 3 billion in today's money). The volcano also spewed up a gigantic mushroom cloud of ash, some 15 miles (25 km) high into the atmosphere. Ash fall affected the territory of 11 US states, and a band of lighter ash eventually reached all around the globe (cf. Krakatoa and Iceland). Volcanic activity at Mount St Helens continued for months after the main eruption, with comparatively minor ash ejections, pyroclastic flows and steam explosions, and a new lava dome soon began to form inside the blown-out crater. But it went quiet after that, except for a phase of renewed activity in 2004-2006 when more explosions rocked the mountain and a strange whale-shaped ridge appeared in the lava dome (the ridge later collapsed again). Mount St Helens has become one of the best-observed volcanoes in the world since the 1980 eruption, but despite having been so thoroughly studied, it is hard to predict what it will do in the future – or when. The devastated land in the blast zone provided naturalists with a never-seen-before open-air laboratory for observing how life recovers from such a blow. Much sooner than had been thought possible, not only plants returned, but even fish soon reappeared in Spirit Lake – despite the heavy pollution from the eruption and the fact that thousands of felled trees remained floating on its surface. Meanwhile trees have started to grow anew amongst the standing deadwood and the felled tree trunks. But the inner pumice plain north of the crater largely remains a wasteland, though even here a thin layer of green has begun to sprout amongst the landslide, pumice and ash deposits that had so thoroughly sterilized the land on 18 May 1980. The area was declared a National Volcanic Monument and has gradually been reclaimed as a recreational area too. The former Spirit Lake Highway was rebuilt (but no longer reaches as far as the lake) and now there are several visitor centres commodifying the story of the volcano and its eruption. Furthermore there are numerous roadside viewpoints and information panels, you can go hiking on trails in parts of the blast zone or even take a helicopter ride. The main volcano observatory and the ridge opposite the volcano were renamed in honour of the volcanologist who lost his life on this ridge in the 1980 eruption: Johnston Ridge, and Johnston Ridge Observatory. The latter opened in 1997. What there is to see: The principal destination within the Mount St Helens National Volcanic Monument (to give it its full official title) is certainly Johnston Ridge Observatory at the end of Highway 504 on the north-western side of the mountain. This has a visitor centre with a small museum exhibition about the volcano; and park rangers are at hand to provide extra information and give talks and demonstrations. In addition there is a movie theatre showing a 17-minute documentary film about the 1980 eruption, including both original footage as well as somewhat over-dramatized animations. Both from the centre's panoramic windows as well as from the large observation terrace outside you get what has to be the best view of the volcano and the inner blast zone. A trail heading eastwards from the visitor centre leads past a memorial dedicated to the 57 victims of the eruption on 18 May 1980. It consists of a curved metal plaque listing all the victims' names. This vantage point too faces the volcano directly across the valley below. In the land around the centre you can see many stumps of trees that were felled by the blast and on the slopes around you can see the the transition between the “blow-down zone” of symmetrically felled trees and the “scorch zone” of still standing dead trees. In between, new trees have begun to grow. 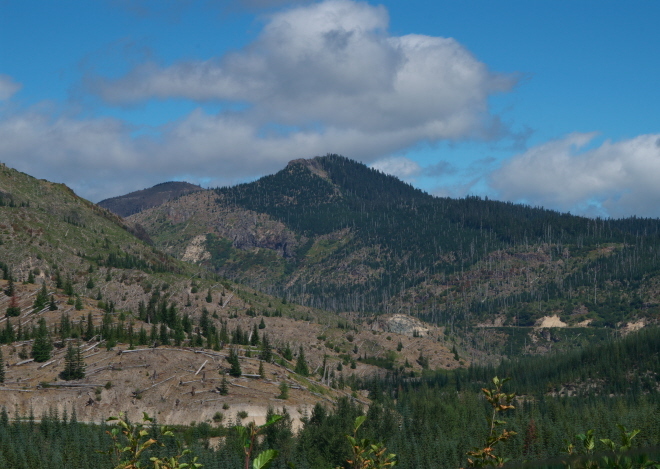 Along Highway 504 there are numerous viewpoints from which to see Mount St Helens from further away, and some also afford good views of the mudflows/lahars that followed the eruption and still clog up riverbeds dozens of feet deep in the north fork of the Toutle River valley. Furthermore there are several other visitor centres, all with a somewhat different topical focus, e.g. on the recovery of nature in the devastation zone, the people involved, or the science side of volcanology. One is the Science & Learning Centre at Coldwater some 10 miles (16 km) down the road from Johnston Ridge. This kind-of stands in during winter as a visitor centre when access to Johnston Ridge is closed. It also runs education programmes year-round. It used to be the main Mount St Helens visitor centre, but closed as such in 2007. Towards the end of Highway 504, 5 miles (8 km) from its intersection with Interstate-5, is the old Mount St Helens Visitor Center, now run independently by Washington State Parks (admission 5 USD). However, I concentrated on Johnston Ridge on my first day's visit to Mount St Helens in August 2015 and did not check out any of these other centres, nor did I invest in a helicopter flight (I had just spent a fortune on a more dramatic one in Hawaii) so I cannot report anything from first-hand experience about these attractions. One thing I did check out briefly on the way down, following a sign between Hoffstadt Bluffs and Castle Rock, was the “sediment retention dam”, reached by a hiking trail from a car park at the end of the short side road. It is about as exciting to look at as it sounds, but it served (and still serves) an important role in keeping the lahar material from spilling further downstream into the Toutle River. The next day I headed towards the north-eastern approach which ends at Windy Ridge – the point where the road takes you the closest to the crater of Mount St Helens. While this is an attraction in itself, the view is perhaps not quite as dramatic as that from Johnston Ridge, since you see the crater more from an angle rather than straight into it. However, what makes the long drive here worthwhile are the other viewpoints en route to Windy Ridge, especially at Harmony, Donnybrook and Independence Pass. From here you get excellent views of Spirit Lake, whose surface is still half filled with floating deadwood, i.e. tree trunks snapped off by the blast of the eruption on 18 May 1980. It's quite a surreal sight to behold. Dotted around the edges of these viewpoints are several information panels with photos, charts and texts putting what you see into perspective. But there are no formal visitor centres on this side of the mountain. This north-eastern route also takes you straight through the different zones, first from unaffected lush and dense forest to the transition zone where new growth forest has sprung up between standing dead trees and then into the blow-down zone, before you reach the edge of the total devastation zone below Windy Ridge. There are hiking trails radiating out from various points here, but I did not have the time to go on any of these. Some lead down to the edge of Spirit Lake, which would have been interesting, but they were long and steep and I had to make it all the way to Yakima that same day, so I couldn't afford to take the time exploring these trails. Finally, there is in theory also a third approach to the volcano, namely the southern approach. But this means mountaineering if you actually want to reach the edge of the crater at the summit of Mount St Helens. And for this you have to apply for a climbing permit beforehand (and have the prerequisite skills, fitness and equipment). I had neither the time nor the inclination to embark on something like that, but it might be a worthwhile adventure trek to consider for people who are into these things. Another attraction south of the mountain is the so-called Ape Cave, which is actually a lava tube (cf. Volcanoes National Park). At over two miles (3 km) it is in fact one of the longest historic lava tubes in the USA (and the very longest continuous one). Access and costs: remote and partly restricted, access roads close in winter; some parts cost small fees. Details: There are basically three different approaches to the mountain. All require a vehicle, some also special permits and/or gear (for hiking/mountaineering). The main, most popular route, and the one to choose if you have only a single day to visit Mount St Helens, is the western approach, via Highway 504, the former Spirit Lake Highway. This road now ends at Johnston Ridge Observatory, which is probably the best of all the viewpoints into the crater. HWY 504 winds its way up for about 50 miles (80 km) from where it connects with Interstate 5 at Castle Rock ca. 10 miles north of Kelso and Longview (or a good 100 miles/160 km south of Seattle along I-5). At Johnston Ridge Observatory there's a large car park a short walk from the visitor centre. Here you are required to purchase a “Monument Pass” which costs 8 USD per person. Opening times: 10 a.m. to 6 p.m.; open seasonally only; winter closure usually lasts from November to mid-May. The north-eastern approach all the way to Windy Ridge where the public road (NF-99) ends is reached via US Highway 12, which runs west to east north of Mount St Helens. At the town of Randle, take Highway 131 south (becomes NF-25) until you come to the turn-off at Iron Creek Falls on the right. It's signposted. From here the road keeps winding and winding up the slopes until you reach the various viewpoints and finally Windy Ridge. At most of these viewpoints/car parks and at Windy Ridge you are requested to purchase a “recreation day pass”, which at the time of my visit cost 5 USD per vehicle per day (you need to purchase one only once, at the first point where they are available, and display it behind your car's windscreen wherever you park). The third alternative is the southern approach. This differs markedly from the other two, though, as it is mostly outside the Blast Zone and is more about nature and hiking. 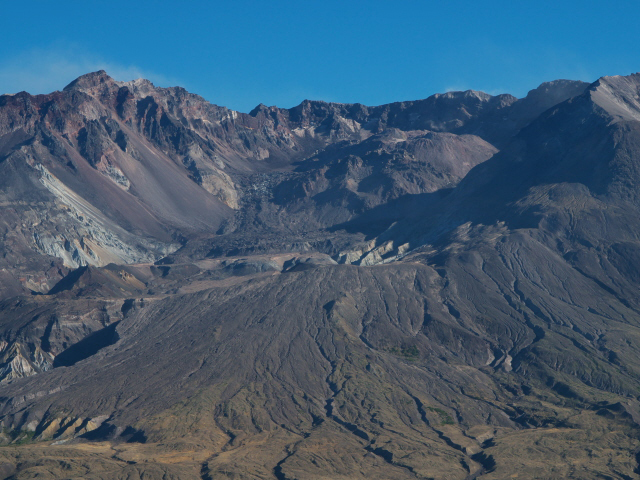 If you obtain a permit (required), though, you are allowed to climb up the southern flank of Mount St Helens and view the crater and devastation beyond from right on the edge. This is the closest you can get to the new lava dome. Access to the inside of the crater is forbidden. You have to be equipped accordingly and be fit enough for this mountaineering trek. At times when volcanologists deem it unsafe, access to the crater may be suspended. Note that there is no road access to the mountain itself from the south. You can drive only as far as the Climbers' Bivouac (recreation day pass required). Hiking within the National Monument boundaries is only allowed during the day, and you have to stay on the trails. No camping and no fires allowed. There is no accommodation within the area of the Mount St Helens National Monument itself. But there are a few options around along the north-western approach road and south of the mountain. Otherwise there are plenty of the usual motel options in nearby towns such as Kelso. Time required: If you wanted to do both the west side and the north-east side of the scenic roads towards Mount St Helens in a single day, you'd have to get a very early start and wouldn't have much time to take it all in at the various points of interest. It's much better to spread a visit over at least two days. Those who also want to go hiking should allocate significantly more time on top of that – likewise mountaineers intent on climbing the southern flank of the volcano (permit required). Combinations with other dark destinations: Nothing in the immediate vicinity, but Seattle to the north-west is within three hours' driving reach. Hanford to the east beyond Yakima could also be reached within a few hours. For everything further away see under USA in general. Combinations with non-dark destinations: The area around Mount St Helens is also a great attraction for nature lovers and prime hiking country. This includes the accessible parts of the flanks of the mountain itself – climbing the south side requires a permit, though, and access to the inside of the crater is forbidden, and restrictions are in place also with regard to Spirit Lake and other parts within the Blast Zone. The recreational area also extends into Gifford Pinchot National Forest and Mt Adams to the east of Mount St Helens. Mt Rainier National Park to the north of Mount St Helens is the other prime destination for outdoorsy travellers and mountaineers. For those more drawn to big city attractions, both Seattle, WA, and Portland just across the state border in Oregon, are within a few hours' driving distance.